Fall means time to make sauerkraut. If you like the tangy goodness of fermented cabbage, making it at home is simple. Using only cabbage and salt, you can have a plentiful supply of homemade sauerkraut, ready to enjoy anytime. Sprinkle salt over layer of cabbage. Using a wooden spoon or plastic masher, firmly tamp the cabbage/salt layer thouroughly, to bring out the juice. Repeat cabbage and salt layers, mashing each layer as you go. When all cabbage is used up, fill a food safe plastic bag will water, and place it directly onto the cabbage, pressing firmly to seal out any air. There will be a juicy layer that has formed betweent the bag and the cabbage/salt layer. Place the jar of cabbage in an out of the way location that remains between 65 and 70 degrees, for 3 to 5 weeks. The warmer the location, the faster the fermentation process. 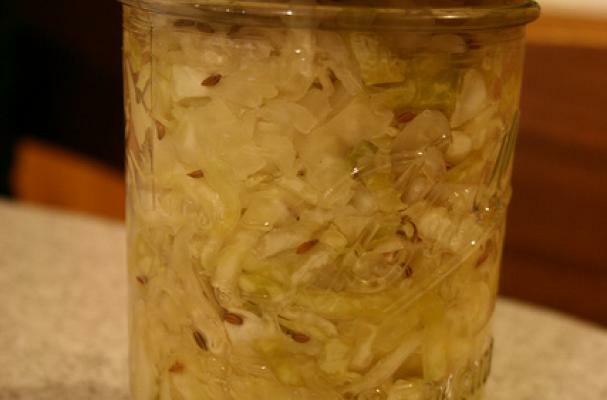 Every couple of days, check the fermentation, and skim off any scum layer that may form on the top of the sauerkraut. Rinse and replace the bag of water carefully each time. Sauerkraut will have a strong odor while fermenting, so it may not belong on your kitchen counter. When it tastes and smells like sauerkraut, it is ready to store. If you make your sauerkraut in quart sized canning jars, it stores easily in the fridge, and can be eaten up in a reasonable period of time. Super recipe, so easy. Most lacto-fermented sauerkraut recipes are long and complicated putting people off. This is straightforward and simple. I've got a 1/2 gallon jar sitting in a bowl on the counter right now, with many additions; apples, kale, carrots, celery, summer squash, green beans....what I got out of my garden. Beets are good too, makes a nice pink sauerkraut, so cheerful for the winter doldrums.